Wolfe Outfitters' guide service runs half-day, three-quarter-day, and full-day guided fly and light tackle fishing trips. Half-day trips last four to five hours on the water. Three-quarter-day trips last about six hours. Full-day trips last about eight hours. The total duration of each trip is tailored to the needs of our clients. Depending on where we are fishing, the travel time to and from the water will vary from ten minutes to ninety minutes each way. The trip times are for actual fishing times, not including the travel times to or from the water. For customers staying at select hotels in Frankfort or Manistee, pick up arrangements can be made upon request. Wolfe Outfitters' guides provide all of the tackle, flies, lures, and other fishing equipment that you'll need for a fun day on the water. We welcome you to bring your own equipment, as well. Wolfe Outfitters' guides also provide snacks and non-alcoholic drinks for all trips. For three-quarter- and full-day trips, guides also provide lunch. If you have any dietary restrictions, please discuss them with your guide prior to the trip. You'll need to bring weather-appropriate clothing including rain gear, even if the forecast doesn't call for it. Dress in layers so that you can adjust to any changes in the weather. Michigan weather is notoriously difficult to predict. You should also bring sunscreen, a hat, polarized sunglasses, a camera, and any personal items you might need, such as medication. Wading trips are available and are done in the warmer months of the year, either with waders or as a wet-wading style without waders. We recommend Gore-Tex waders for their superior breathability and lack of bulk when wading, especially during summer months. If you are interested in a wading trip, please discuss options and availability when booking your trip. Wolfe Outfitters is fully insured, and is licensed and permitted to run guide trips by the State of Michigan, the US Forest Service, the National Park Service and the US Coast Guard. 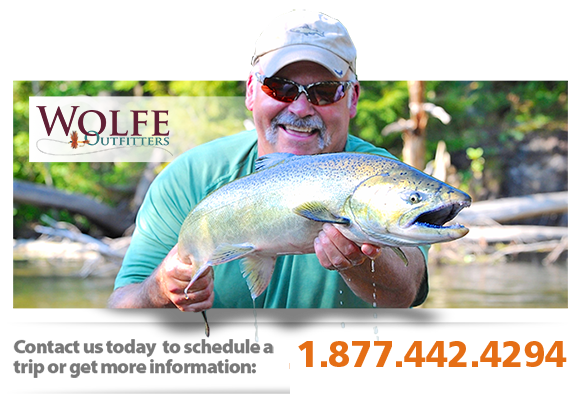 Please see the About Wolfe Outfitters page for more information about our guides. Wolfe Outfitters holds Special Use permits for trips inside the Manistee National Forest, utilizing Federal launch facilities. Wolfe Outfitters is the only permitted guide outfitter allowed to guide customers inside the Sleeping Bear Dunes National Lakeshore, giving customers access to world-class fishing. All 6 and 8 hour trips include a hot grilled lunch right on the boat. Please consult with your guide while booking to discuss possible limitations caused by adding a 3rd person. We will make every effort to be accommodating, but adding a 3rd person in some situations may not be possible. Please contact us via our online form or by calling 877-442-4294 for big lake fishing trip rates. Wolfe Outfitters reserves the right to retain your trip deposit or 50% of the trip cost at our discretion if a trip is cancelled within 21 days of its scheduled date without rescheduling. We understand that things arise which may not be avoidable, and we try to work with each customer in these cases. Wolfe Outfitters has multiple guides that work for the company, and we need to be fair to each guide, as a last minute cancellation may be difficult to rebook. Wolfe Outfitters also reserves the right to cancel or postpone trips at ours and/or our guides' discretion if there is unsafe weather or unfishable conditions. Our customers' safety is our top priority, and we will try our best to reschedule trips when Mother Nature forces us off of the water.